Discover our Theory on Beauty that gives our Team an Incredible Advantage. Click here for our Asian Plastic Surgery YouTube Playlist. 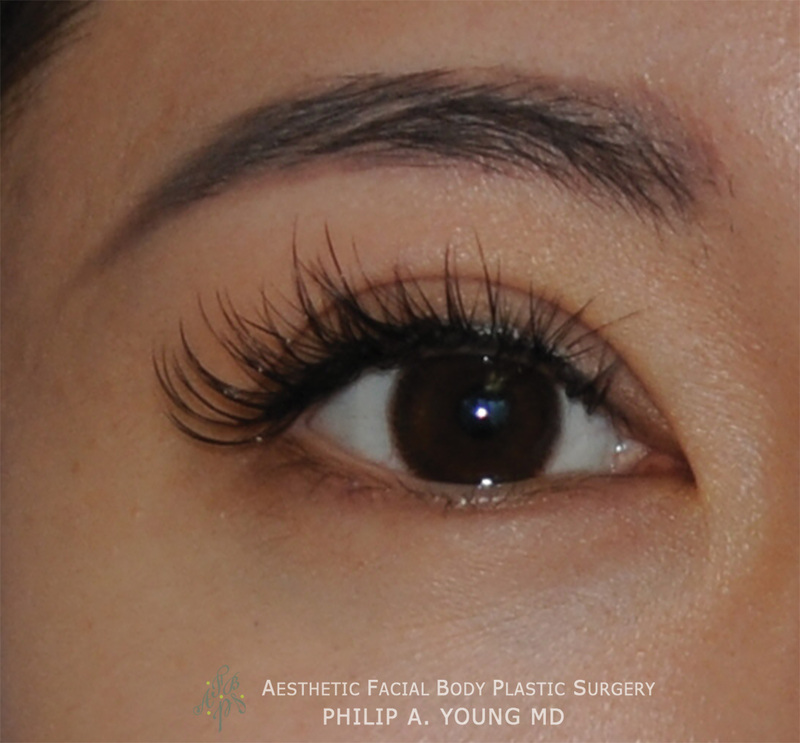 Award Winning Seattle & Bellevue's Dr. Philip Young has more than 15 years of experience performing Asian Double Eyelid | Crease Formation Surgery. He has lectured and done live demonstrations in multiple cities in Asia including: Linyi and Jinan, China: and Saigon and Hue, Vietnam. He has trained with some of the world’s best facial plastic surgeons. You can read more about this here: Top Ten Reasons to choose Dr. Philip Young. Perhaps the most interesting thing about us and Dr. Young is his groundbreaking Theory on Facial Beauty called the Circles of Prominence. Above is a 20's Asian Female from Seattle, Washington. Above is also a 20's Asian Female from Seattle, Washington. 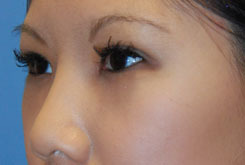 Asian Eyelid Surgery is a unique segment of Asian Plastic Cosmetic Surgery and predominately concerns the formation of the Double Eyelid. 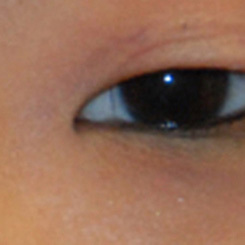 Many Asians are born with a single eyelid fold. Sometimes the eyelid skin can encroach on the eyelid margin and eyelashes. This can make the eye look smaller. 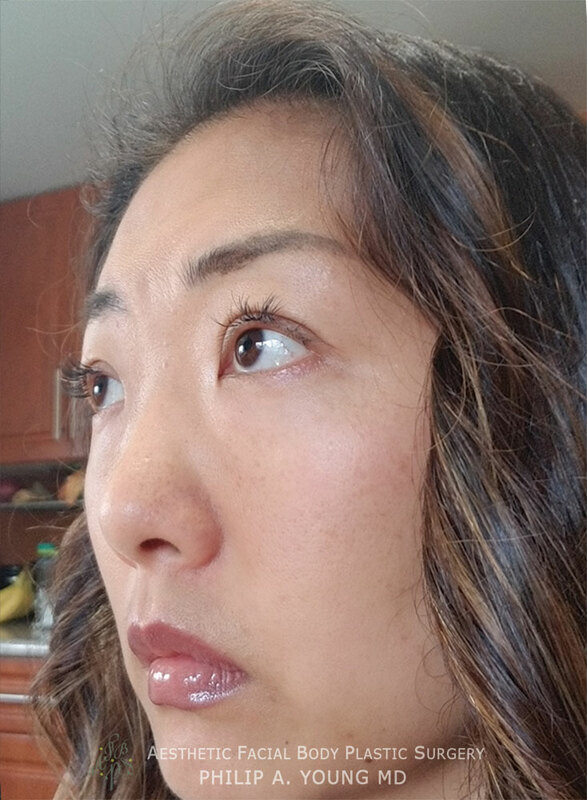 The creation of a double eyelid can decrease this anatomical variant and give the eye the appearance of being more open and larger by elevating this eyelid skin from covering the eyelid margin. 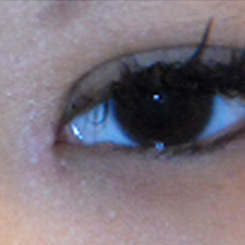 Another way the double eyelid crease makes the eye look bigger is from the shadowing that the crease creates. This shadow associates with the darker iris (in contrast to the stark white sclera) to give the illusion of a bigger eye in that way as well. If you are interested at any time about scheduling an appointment you can email, phone 425.990.3223 (Office) and even text message us 425-505-0938 (Mobile) at any time. Click here if you would like to find out more about our consultation process. The main ways to do this type of a procedure can be through sutures or through an open technique. 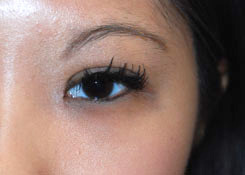 Dr Young can create the double eyelid crease through both approaches. He prefers to create the crease with an incision for many reasons (open technique). 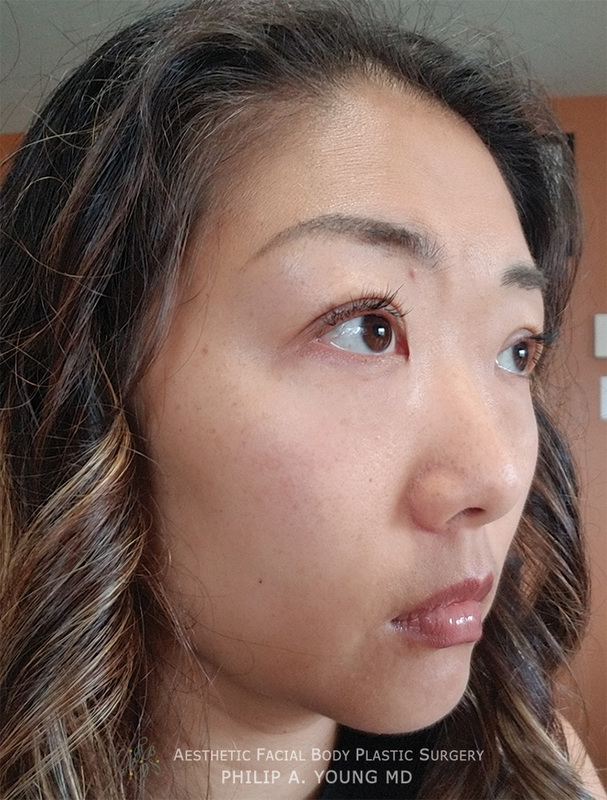 When the double eyelid is created through an incision, the results can be more accurately determined, lead to less variable results and can last much longer. With the suture technique, although it is attractive because it is done without significant incisions, you have a greater chance of having more variable results. 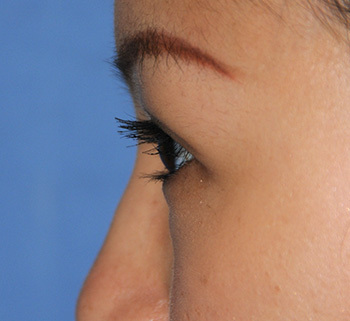 Your crease can be discontinuous, relax asymmetrically, and multiple folds can be created more commonly through sutures versus with an open incision technique. 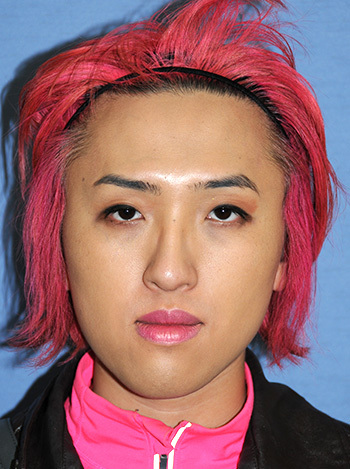 Dr. Young uses a special technique for his double eyelid creation which is called orbicularis levator fixation (developed by J. Park). This special approach entails using a permanent stitch that is buried underneath the eyelid skin. The suture is used to attach the levator to the orbicularis muscle. 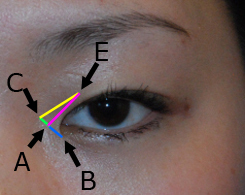 The levator muscle’s primary action is to elevate the eyelid margin, or open the eye and eyelid. The orbicularis muscle is more superficial and is responsible for closing the eye, winking, and squinting. 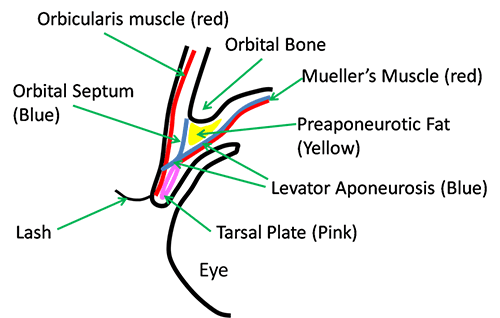 Because the orbicularis is so tightly adherent to the skin, attaching the levator to the orbicularis essentially attaches the levator to the skin. This allows the eyelid crease to form through this association. Because it is buried, it is less dependent on scar formation to form the crease and more on the action of the suture. 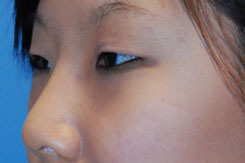 This allows the creation of the crease to be even more longer lasting, reliable, and accurate than traditional double eyelid creation techniques which predominately depend on scar formation. This technique is very difficult and takes a lot of experience to master. Because of this, only a small percentage of surgeons use this technique. Below is a picture that shows the anatomy of this region to help you understand this technique. "Yes those pictures are ok with me. The after picture is not the best selfie but if you like the eye area then it's ok with me. I'm healing very nicely. I love the result. This is the latest picture of myself. I love the difference! So happy I got it done. Thank you!...Happy with the healing. Ppl can't tell what's different when they see me. Which I think is good 😊...I just wanted to say thank you again for your wonderful services. I was nervous about the procedure and I didn't need to be. You guys made me feel so comfortable and Dr young is amazing. I definitely chose the right surgeon. I'm healing very nicely. Swelling is going down. I had no bleeding or bruising. I will send pictures soon. " 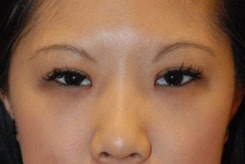 - 30's Asian Female, Canada after her Asian Double Eyelid Procedure. 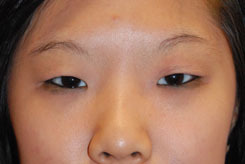 Before and After Creating the Double Eyelid Crease in an Asian Eyelid with the Orbicularis Levator Fixation Technique and Medial Epicanthoplasty. 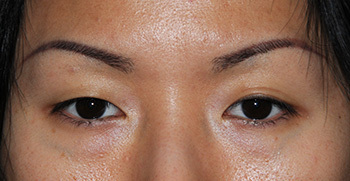 Before and After Creating the Double Eyelid Crease in an Asian Eyelid with the Orbicularis Levator Fixation Technique and Medial Epicanthoplasty Close Up Views. 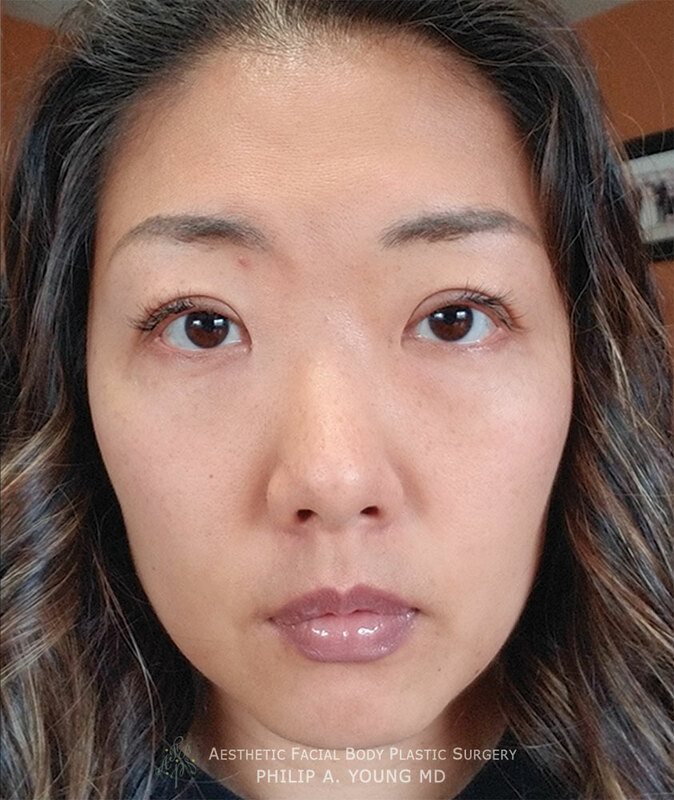 Before and After Creating the Double Eyelid Crease with the Orbicularis Levator Fixation Technique with Medial Epicanthoplasty. 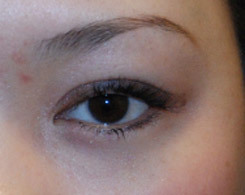 Before and After Creating the Double Eyelid Crease with the Orbicularis Levator Fixation Technique with Medial Epicanthoplasty (Oblique View). 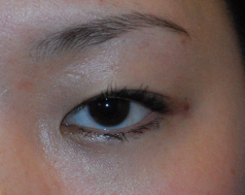 Before and After Creating the Double Eyelid Crease with the Orbicularis Levator Fixation Technique with Medial Epicanthoplasty (Close up View of the Left Eye). 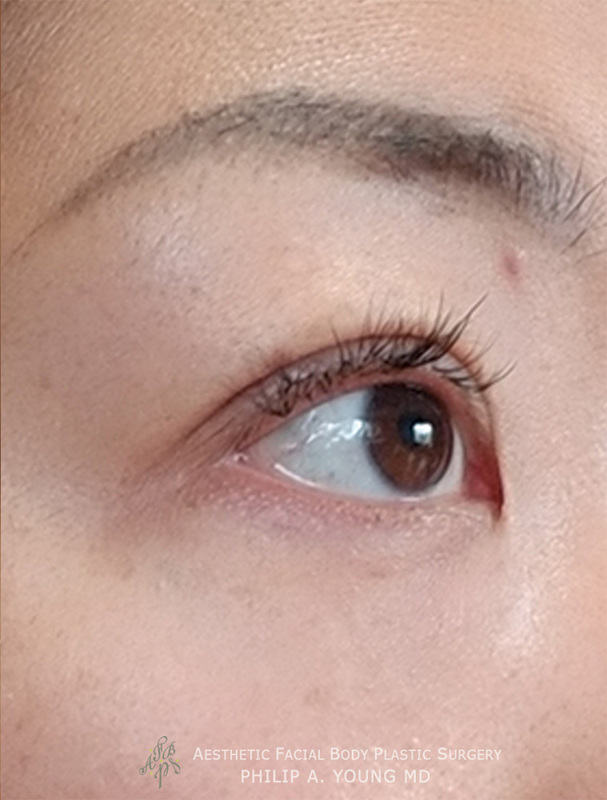 Before and After Creating the Double Eyelid Crease with the Orbicularis Levator Fixation Technique. Creation of the double eyelid is just a part of the process and there are other options with different procedures that can additionally beautify the Asian Eye. One major possible option includes a procedure that involves the middle part of the eye, called a medial epicanthoplasty. This procedure entails rearranging or excising this tissue to give the appearance of a larger looking eye. This is done by opening up the eye mainly in the horizontal direction. Medial Epicanthoplasty for Epicanthal Folds: During our development, our nasal bridge rises to a certain degree and with it, the skin at the medial part of the eyes can be brought in or left out. Whenever this process is interrupted during our development in the womb and after will lead to a different appearance in the eye. 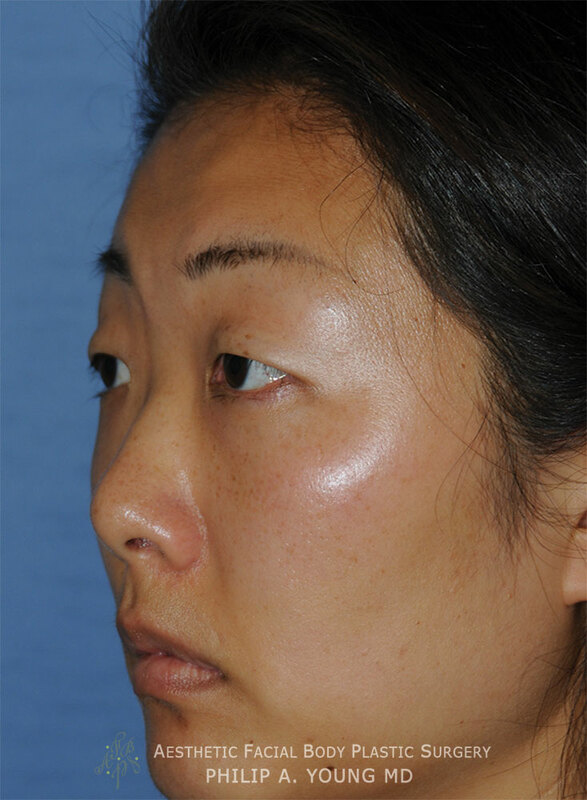 For some Asian people, this skin is left over the medial part of the eye. This extra skin has been termed the epicanthal fold. You can classify the epicanthal fold in many ways, the following is a really common way to classify this anatomical variant: Type 1 is in the situation when there is no epicanthal fold and this can be found in Caucasians. Type 2 is when the fold just starts to encroach on the lacrimal lake (the pink fleshy tissue between the fold and white sclera part of the eye, see picture below) area but does not completely cover it (covering only the top portion mostly). Type 3 is when the fold completely covers the lacrimal lake area. 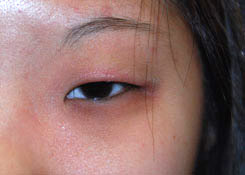 Type 4 is similar to Type 3 but in addition originates mostly from the lower eyelid unlike type 1-3. Below is a picture of the medial part of the eye. 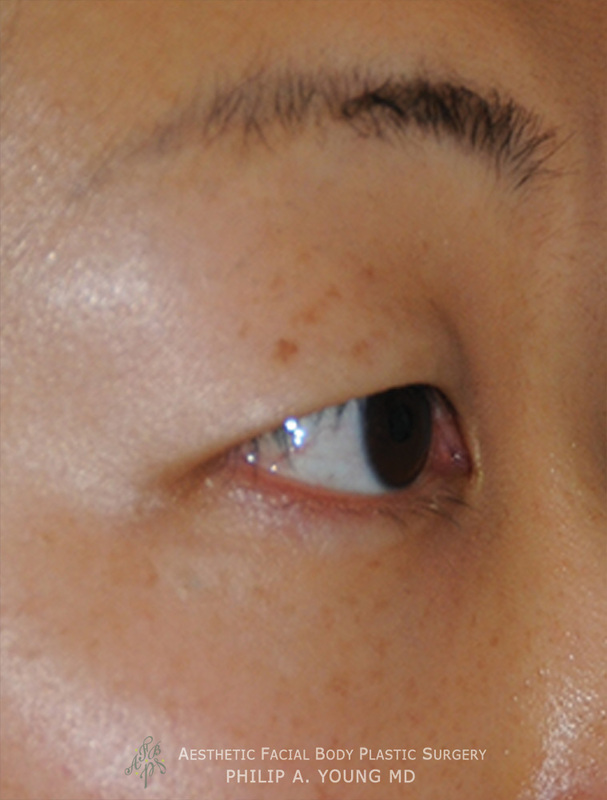 A Medial epicanthoplasty can be used to reduce the epicanthal fold for Types 2-4. The eye in the picture below would be classified as Type 2 because there is an epicanthal fold but you can still see some lacrimal lake tissue. 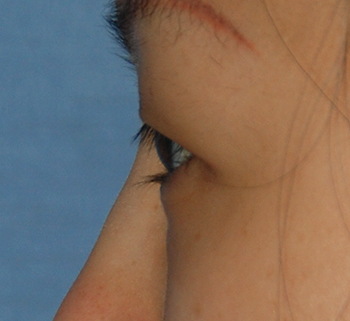 There are many ways to carry out a medial epicanthoplasty. 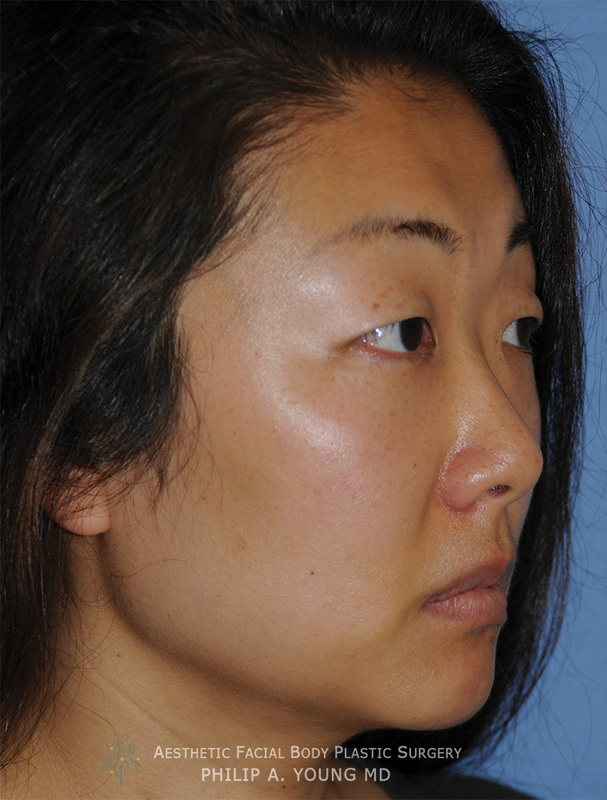 Most traditional procedures approached correction of this area with incisions that are medial to the epicanthal fold. Very often, these incisions lead to significant scarring which were undesirable. More currently, incisions are now contained within and very near the epicanthal fold to reduce the scarring that can occur in this scar prone area. 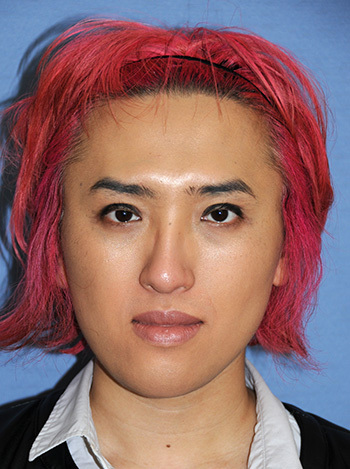 Dr. Young has done many of these techniques and through experience prefers the epicanthoplasty developed by Dr. Park. This unique procedure keeps the incisions mostly on the epicanthal fold and rearranges the tissue to reduce the amount that the fold covers the lacrimal lake. The results can be a significant increase in the horizontal dimension of the eye and ultimately a larger looking, more beautiful eye. 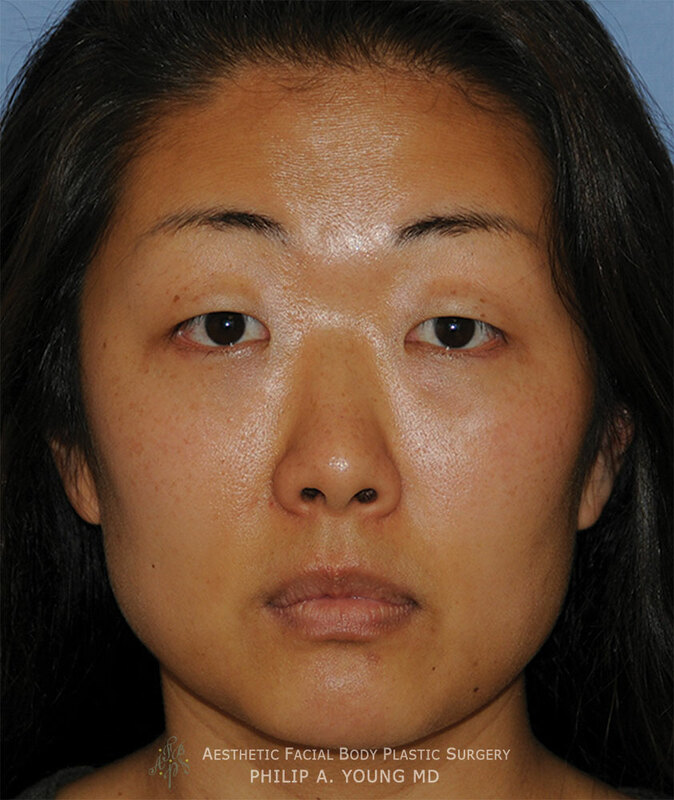 Above Picture: Here is a close up of the Before and After a Medial epicanthoplasty. Notice that the lacrimal lake area (fleshy pink part in the middle of the eye) is much more exposed. The ultimate result is that the horizontal fissure of the eye is enlarged. Notice how the area around the epicanthal fold has really no scarring. This is a very prone area to scar, historically, and is a significant measure of success after this procedure! 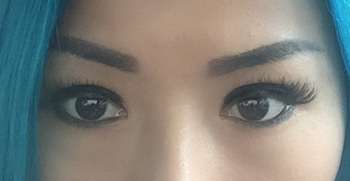 Double Fold Crease Surgery to Actually Make the Eyes Bigger: Below are a pictures of a single eyelid that actually is covering this person's eyelid margin effectively making the eye smaller. 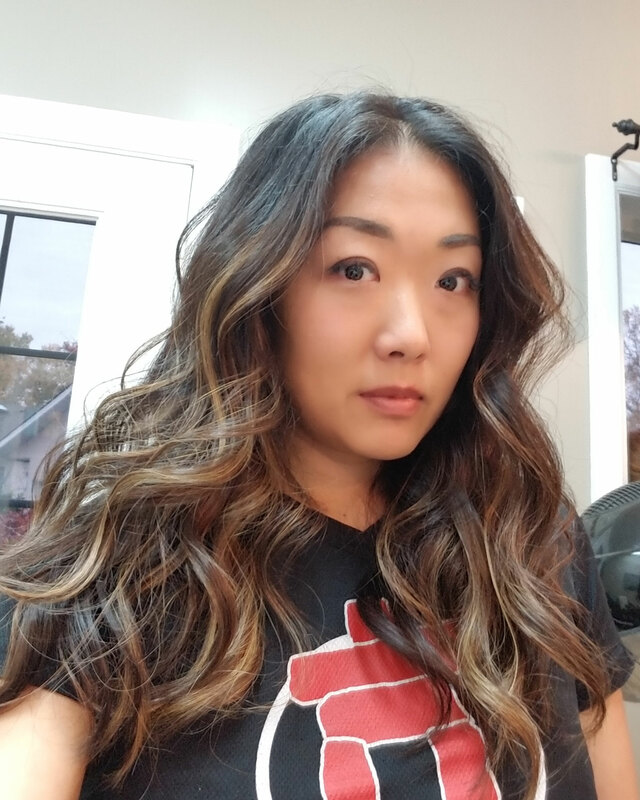 In the before picture, she looks tired and aged and her eyes look small. In the after picture, her eyes not only look bigger they are actually bigger because the skin that was folding over the eyelid margin has now been reset in the crease. This was done through the orbicularis fixation technique. 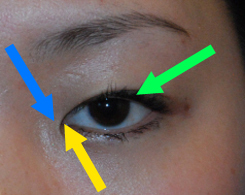 Asian Eyelid Surgery to Restructure the Eyes: Below the pictures are showing thin skin and a depression in the upper eyelid (most evident on the front view). 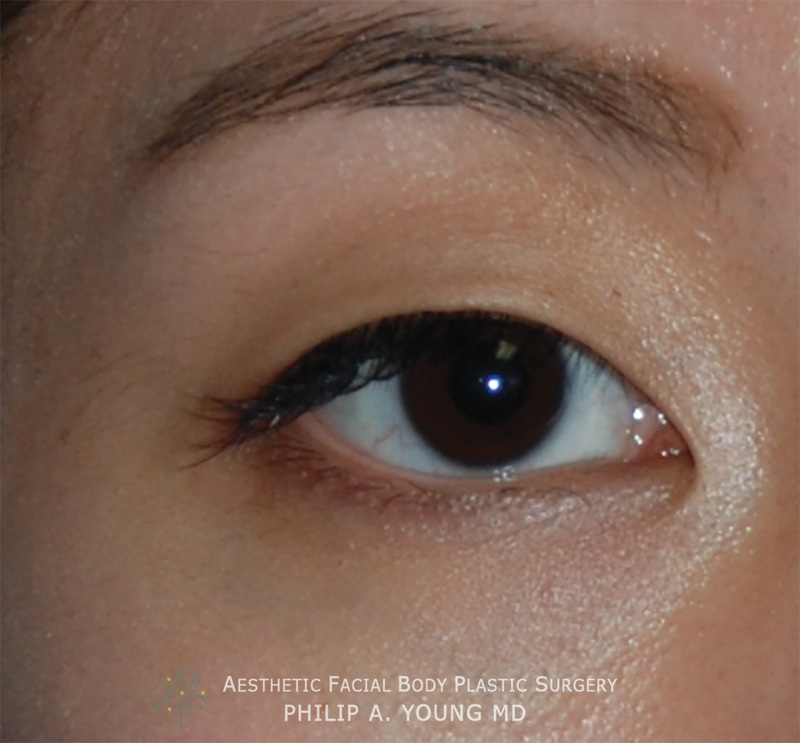 Through the Asian Double Eyelid Surgery, we were able to restructure the depression and increase the fullness in the upper eyelid while creating the crease. The crease essentially made this area the appropriate area for hollowing which is inferior to the crease or fold area while creating more proper volume above the crease | fold.